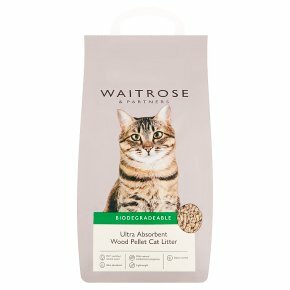 This natural and recycled cat litter is the perfect way to care for your pet, while minimising your impact on the environment. These wooden pellets offer supreme absorbency and give off a natural pine fragrance to combat unpleasant odours. The bag contains 10 litres and as part of the Waitrose range it comes with all the quality and value you'd expect. provide a tray large enough for your cat to use comfortably. Fill to a depth of 3-5cm. Inspect tray on a daily basis and remove solid waste with a scoop. Dispose of with the appropriate household waste. Shake the tray to bring fresh pellets to the surface. Clean tray regularly with mild detergent and ensure fully dry before filling with fresh wood pellets. It is recommended, for hygiene reasons, that disposable or rubber gloves are worn whilst handling soiled litter and washing the tray.. Pregnant women, nursing mothers and small children should avoid contact with soiled litter.. Do not compost or dig into the garden as cat faeces may contain bacteria.